At OFED, we share a vision of sustainable and strong rural communities in West Africa, where women are empowered to take charge of their own economic future through agricultural and rural development and where children are empowered through early and effective education. We work every day to empower women and children in developing countries by bolstering their abilities to provide for themselves and by striving for an environment that will guarantee a better quality of life for their communities. To do this, we have installed such programs as Simplified Cooperative Societies (SCOOPS) to support rural women in entrepreneurship endeavors by training them in business management. However, with the implementation of these SCOOPS, we discovered that many rural women were illiterate (including 95% of women in the SCOOPS), making it difficult for them to keep up with their financial management documents. Therefore, they must rely on literate men to help with many aspects of their business. 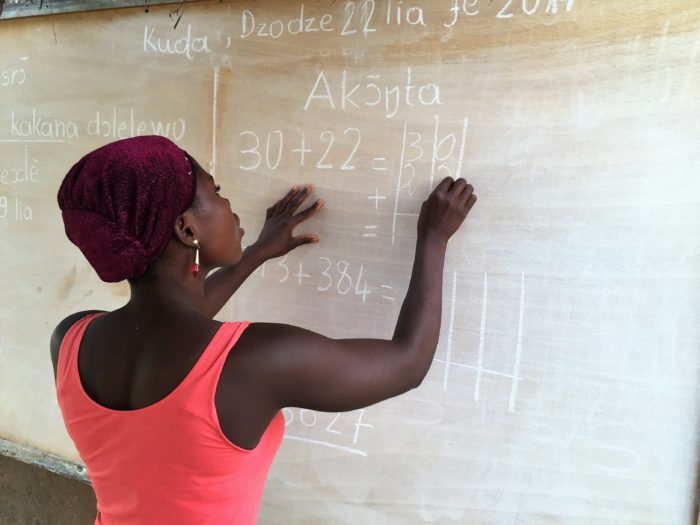 To address this problem, OFED initiated the Adult Literacy Project, a project based in the township of Kati in the Republic of Togo, spanning 22 months, and aimed at teaching rural women basic reading, writing and literacy skills so they can better manage their own businesses. The project looks to strengthen the abilities and qualifications of instructors to better equip them to continue teaching, enroll 100 SCOOPS members in literacy courses in Ewe (the local language) and French, and follow up post-literacy courses to ensure the acquired skills are serving them well. In Togo, women are almost twice as likely to be illiterate compared to men (Institute for Statistics 2011). On the contrary, literacy is a fundamental right for all human beings, and increasing literacy in a community often has “a positive ripple effect on all development indicators” (UNESCO). With this project, we hope to teach these women literacy skills, thus enabling them to build and better manage their businesses. However, we also hope to cause a positive ripple effect of development in the community and to reduce poverty in the township of Kati, bringing us closer to our vision of sustainable and strong rural communities in West Africa.